‘Chicken with Plums’ in English. Saw it yesterday. 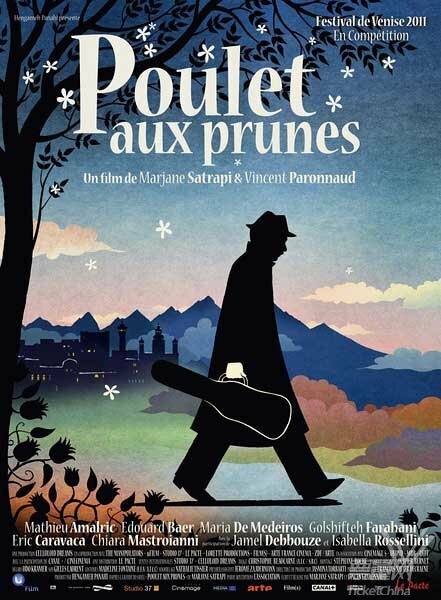 It’s the second film by Franco-Iranian graphic novelist Marjane Satrapi, whose first was the excellent ‘Persepolis‘ (both co-directed with Vincent Paronnaud). It’s a wonderful film, which grew on me as it progressed and the story came together. Jay Weissberg’s review in Variety gets it exactly right. This review too, as well as this one, though I differ with the latter on the impossible love story between the main character Nasser Ali—played Mathieu Amalric, who’s excellent as always—and the young Irâne—perfectly cast with the beautiful, sublime Golshifteh Farahani—, which I found effective and very moving. One of the best films of the year. À ne pas manquer. A very interesting op-ed by Daniel Yergin in The Washington Post, on the future of the world oil market. This is one of those rare op-eds where one learns something new and important. 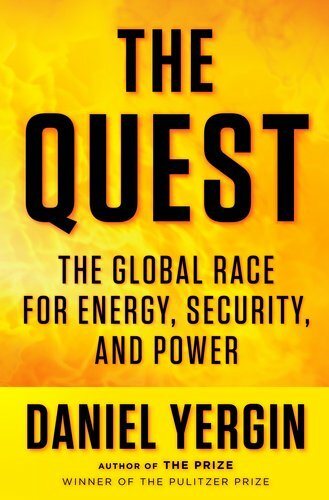 No one knows the subject better than Yergin. I read his book on the history of oil, The Prize, some fifteen years ago. A great read. One of these days I’ll get around to the sequel, which came out just last month. The definitive results of the Tunisian election have yet to be announced, now three days after the polls closed. Until we have the final numbers I will refrain from engaging in commentary or analysis, except to say that I am favorably impressed by the way things look so far (as of midday Wednesday CEST), notably by the unexpectedly (for me) strong showing of the secular parties (secular being shorthand here for non-Islamist and non-conservative). 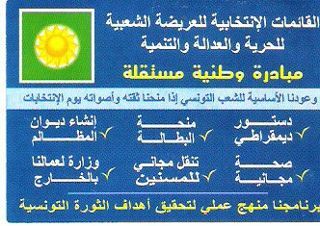 Ennahda is the no. 1 party by far—hardly a surprise—but looks like it will fall well short of an absolute majority of seats, necessitating a coalition with non-Islamist formations. Well, maybe. One of the surprises of Sunday’s vote is the exceptionally high score obtained by a party called Al-Aridha al-Chaabia lil-Adalaa wal-Hourria wal-Tanmia (Popular Petition for Justice, Freedom, and Development), which is holding third place with 25 seats (of 217), winning seats in 20 of the 27 constituencies (plus one for Tunisians abroad), and doing particularly well in Kasserine and Sidi Bouzid governorates. In some polling stations in Sidi Bouzid—where the revolution started—, Al-Aridha received 90% of the vote. This is all a surprise because the party was ignored during the campaign and with practically no non-Tunisians outside the country having ever even heard of it. It was completely off the radar screen, mentioned nowhere in the media and figuring in no public opinion poll. And it was not mentioned in the ICG’s most recent report on Tunisia. Al-Aridha is so obscure that there is no Wikipedia entry on it even in Arabic, let alone French or English. When I and others following the election first saw the party’s name and its high score, the reaction was WTF? who are they?? One Tunisian analyst wrote yesterday that “not even Nostradamus would have predicted such a success” for Al-Aridha. As Al-Aridha’s bloc of seats could hold the balance of power in the Constituent Assembly—allied with Ennahda, it would give the latter the majority without having to depend on the established secular parties—, the question is not impertinent. This is particularly so as the first bits of information hinted that Al-Aridha could have an Islamist orientation. As one learns, the party is entirely the creation of an operator named Mohamed Elhachmi Hamdi, a ouled el bled from Sidi Bouzid who owns and runs the Al-Mustakilla satellite television station based in London, where he has lived since the ’90s. He was indeed an activist in the Islamist MTI—Ennahda’s predecessor—from the late ’70s to 1992, when he quit the movement. But he remained an Islamist of sorts in the ’90s, during which time he was apparently close to Sudan’s Hassan al-Turabi. Like Turabi, Elhachmi Hamdi is an intellectual and with solid academic credentials, having defended a doctoral thesis in 1996 at the University of London on Ennahda and the politicization of Islam, and which was published by Westview Press in 2000. He was likewise a contributor to a forum on Islam and liberal democracy in the April 1996 issue of the Journal of Democracy (published by the National Endowment for Democracy in Washington), where he critiqued the contributions of Bernard Lewis and Robin Wright (see here and here). In his JOD piece Elhachmi Hamdi let it be known that he was the translator for Robin Wright in an interview she conducted with Rached Ghannouchi in Washington five years earlier. His campaign for this election was waged entirely from London via Al-Mustakilla, with Elhachmi Hamdi—speaking in his accent du terroir—engaging in the most shameless populism, promising to turn Tunisia into an “Eldorado in 90 days,” with the creation of 500,000 jobs, universal health care, free public transportation, and other monts et merveilles. Immediately, as of November 1, 2011. All this would be financed via a surtax on air tickets and enlisting famous Tunisian football players to raise money through charities and organizing festivals, among other schemes. Dr. Elhachmi Hamdi sounds more like a cross between Herman Cain and Ross Perot than Rached Ghannouchi or Hassan al-Turabi. It obviously worked for his party and him personally, as he won a seat from Sidi Bouzid (for sources on all this, see here, here, here, here, and here). The fact that Elhachmi Hamdi waged his campaign from abroad, via foreign-based media, and with sources of financing of uncertain origin may result in his entire list being invalidated for violations of the electoral code (see here, here, and here). I have learned since starting this post that the official announcement of the election results has been delayed to November 9th. The invalidation question is no doubt the main reason why. If Al-Aridha’s list is invalidated, it will considerably alter the distribution of seats in one direction or another. This is a big deal. Paul Krugman has a typically excellent, on target column today, on the GOP’s proposals to weaken environmental regulations as a way of creating jobs. Krugman, in rubbishing the batty proposals, correctly labels the GOP the “party of pollution.” I’ve in fact been thinking about pollution since visiting Los Angeles two months ago. It was my first time in L.A.—a cool and interesting city IMO—in over thirty years. I didn’t think much about the air quality, which didn’t seem worse than any other large American or European city I’ve visited in recent times. As practically everyone I know in California is originally from somewhere else, they couldn’t speak about the past there, but I did meet precisely two L.A. natives of my generation, who grew up there in the ’60s and ’70s, and talked about the city’s legendary smog. It was worse than bad. There were days when one could hardly go outside, weeks on end when one never saw the San Gabriel Mountains because of the smog cover. As I have learned, the worst decades were the 1940s through the ’60s (e.g. see here). In October 1954 L.A. schools were closed for the whole month and children kept home due to the health hazard presented by the smog. 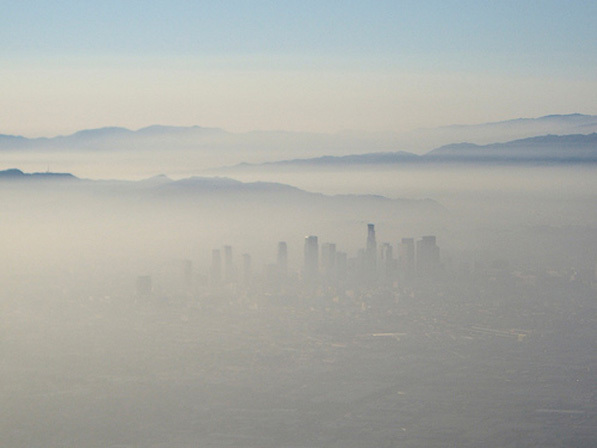 The L.A. smog situation has improved dramatically over the past four decades, of course, thanks to the panoply of Clean Air Acts and other environmental laws and regulations, enacted or decreed at both the federal and state level. And the population of the L.A. metro area is rather larger now than it was then, and with that many more cars. It was likewise elsewhere. The air pollution in Paris was terrible in the 1970s; there are still bad days in the summer but the overall situation nowadays is far improved. Ankara, Turkey, where I lived for several years in the late ’60s-early ’70s, had one of the worst air pollution problems in the world at the time. The city is in a valley ringed by hills and where all buildings were heated by coal. Ankara was a truly awful place to live in the winter. In the 1980s the government made the decision to switch to natural gas. Consequence: greatly reduced pollution (and a much more liveable city). Reason: state regulation. My question to libertarians—and to anti-government Tea Party GOP types more generally—after my L.A. visit is this: if they had their way and government got out of the business of environmental regulation—and with clean air and other such acts repealed in the interest of an unfettered free market, not to mention abolishing subsidies for mass transit—, what do they think would happen pollution-wise? If there were a return to the smog status quo ante—an inevitability, one would presume—what would they propose doing about it, if anything? Just asking. ADDENDUM: I have learned just now (October 21) that California regulators have adopted new limits on greenhouse gas emissions. Good for you, California! UPDATE: Check out the 17-minute video, Clearing California Skies, posted on YouTube by the California Air Resources Board. I’ve already asked this question in a couple of posts over the past few months. Now we have the beginnings of an answer with the first head-to-head Sarkozy-Hollande poll since the PS primary. It’s too bad it had to come out on the day Sarko is celebrating the arrival of his newborn, as the numbers are not good for him, to put it mildly. 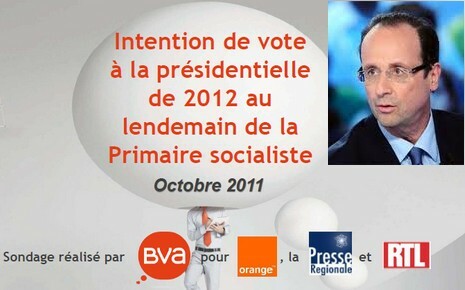 In the 2nd round, Hollande gets 64%, Sarko 36. You read that right. Check it out here. Okay, it’s just one poll and the 1st round is still six months away. But still. These are devastating numbers for Sarkozy. It’s going to be tough for him to claw his way even into the 40s, let alone to 50.01%. It’s a very steep hill to climb. Without a game changer or accident it’s just not going to happen. The Elysée and UMP may not be panicking yet but they will be soon if the numbers don’t start to move up. If Sarko is still below or around 40% at the end the year, the pressure on him from the UMP to pull out of the race will be intense. 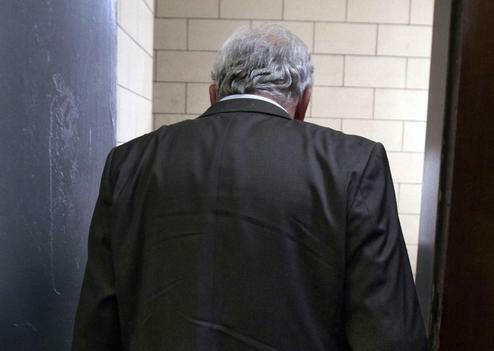 Alain Juppé is getting ready, no doubt about it. 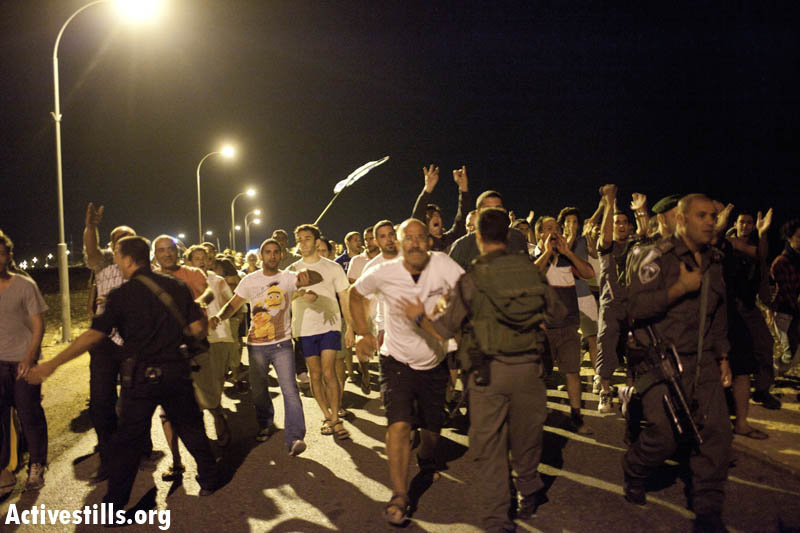 David Shulman of Ta’ayush has a two part must read report from the West Bank on the NYRB web site (here and here). The second part recounts the outrageous behavior of the settlers—not just religious fanatics but also seculars—who go about their despicable deeds with seeming impunity. Read it and fume. If there is ever to be a peace agreement between Israel and Palestine, it had better happen quickly, before there’s no land left to be returned to its rightful owners. No one who has seen Israeli policy toward Palestinians and the institutions of the occupation in action can have any doubt that they are directed to one overriding goal—a land-grab of truly astonishing proportions. This seems pretty obvious. Even if negotiations don’t culminate in a full-fledged permanent peace agreement—which is out of reach at the present time and probably for the foreseeable future—they could at least conclude with a long-term interim agreement—such as argued most lately by Shlomo Avineri—that would put an end to land confiscation and the cancer of settlement expansion. This would still have to be negotiated by the Palestinian Authority and Israel, though, and the former has been refusing to return to the negotiating table until the latter unilaterally halts settlement construction, including in East Jerusalem. No one has ever accused the Palestinians of being excellent strategists but this I really cannot comprehend. The PA’s refusal to negotiate in no way inconveniences Bibi Netanyahu and Avigdor Lieberman, not to mention the rest of that governing coalition. The PA’s rhetoric on this is music to their ears. And à propos, Salam Fayyad, the paragon of moderation, reiterated just yesterday in Washington “that conditions are not ripe, at this juncture, for a meaningful resumption of talks”… Read it and weep.